Boeuf Bourguignon is basically a French beef stew. 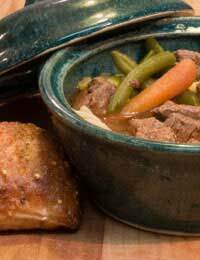 The difference between this type of beef stew and others is that the meat is marinated overnight, before cooking. This is a recipe from the 1960’s that in some way lost favour with cooks, perhaps because of the preparation time involved. By simply planning ahead there is no reason why you cannot serve this delicious stew for your family’s dinner. Because the beef is marinated and then cooked over a long period there is no need to purchase the more expensive, better quality cuts of beef. Chuck steak, stewing steak or braising steak are all ideal for this recipe. This recipe can be cooked in bulk and frozen for future use. Multiply the quantities of ingredients according to your needs. Label and freeze in sealed containers once cold. 1 large or 2 small onions, chopped. Butter and flour to thicken sauce. Place cubed beef into a glass mixing bowl. Add the onions, carrots, bay leaves, garlic and clove. Pour the red wine over the ingredients and cover with cling film. Leave in the fridge overnight or preferably for 24 hours. Heat butter in a pan but do not allow it to burn. Take the meat from the marinade and pat dry with kitchen paper. Fry in the butter turning the meat until it is brown on all sides, liberally cover with black pepper and salt if preferred. Place into a warmed ovenproof dish with a lid. Next drain the vegetables and place in the butter, adding more butter if needed. Cook until the onion is soft and clear. Add this to the meat in the casserole dish. Finally, pour the marinade mixture into the pan and heat through before tipping it on top of the meat and vegetables in the casserole dish. Cover with the lid and place in the middle of the preheated oven for three to four hours. Mix a little flour and butter together and add to the Bouef Bourguignon to thicken. This recipe does not need a heavily flavoured accompaniment as it will detract from the flavour of the casserole. Serve a simple mashed potato and seasonal vegetables or perhaps rice and mushrooms. For a quicker recipe you can ignore the marinade stage although the meat will not be so enriched with the wine. In this case make sure that the beef that you use does not need to be cooked over a long period. Once the meat and vegetables are browned cook in a hot oven 200 c or gas mark 6. Make sure in this case that you use a good strong red wine. The alcohol should cook away during cooking so your dinner will have a rich flavour but should not be alcoholic and so is suitable for older children to enjoy.